The Adelante Movement has started the year on a roll !! First, the United Nations, then The Clinton and Gates Foundation's No Ceilings event in NY. The Adelante Movement is going to New Mexico! Remember, 2015 is about completion! Let's work on it together in Santa Ana Pueblo, New Mexico. 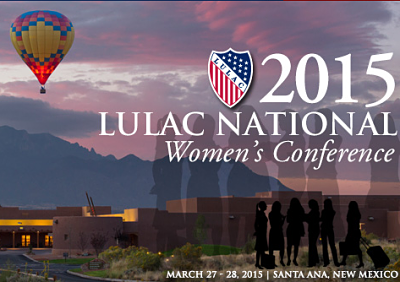 Please join me for a FREE Adelante Movement workshop, presented by Coca-Cola, during LULAC’S (League of United Latin American Citizens) National Women’s Conference in beautiful Santa Ana Pueblo, New Mexico. The morning kicks-off with a motivational talk during breakfast and will be followed by a workshop, “Ten Questions to Ask Yourself Before Starting a Business” that will be held from 10:15-11:15 am. Our great partners at LULAC have opened this event to members of Adelante! You can attend the workshop FREE of charge, including the breakfast and luncheon, come and join us! All of our members in New Mexico, please come! As you can imagine, seating is limited so please register today, click HERE and reserve your space for this complementary workshop.